The Jordan Brand ramped up production of the Grape 5 due to hype. Even with higher production and retail availability, the Grape 5 sold out within minutes. It is possible they have decided to do the same with the Black Grapes which would explain the delay. 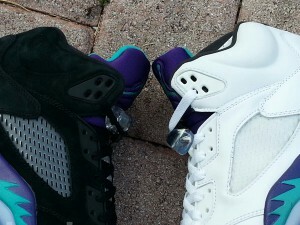 There have also been persistent rumors of the White Grapes restocking at the same day the Black Grapes launch. No confirmation yet of this rumor, but it’s piqued the attention of sneakerheads and resellers. Either way June 15th will be a big day for Jordan fans.